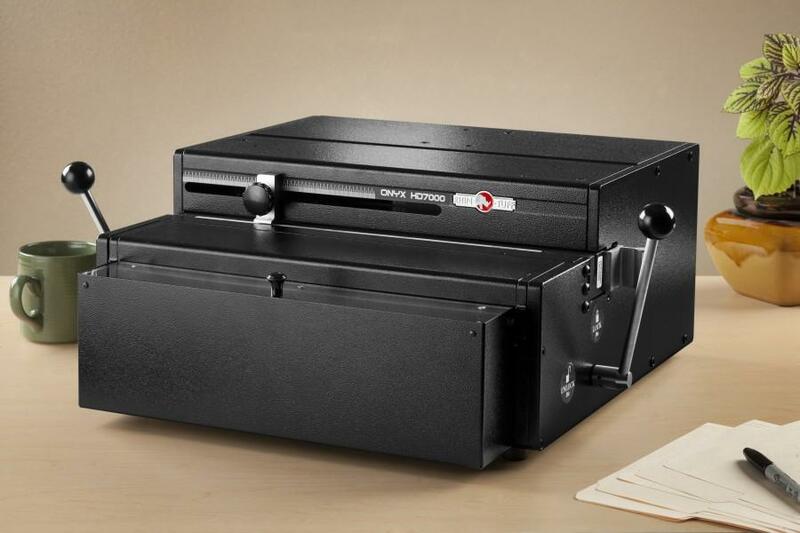 The HD7000 is a 14-inch (356 mm) open-ended spiral, comb, wire and coil punching machine that features the patented “quick change” die system for changing punch patterns in 30 seconds; no tools required and no bolts or screws to replace or misplace. The HD7000 was designed with the operator in mind, offering quick, easy set-up including easy pin pulls and pre-set paper stop positions. With a three-year warranty, this is truly the industry standard. Rated up to 40 sheets or up to 80 pages of 20-pound (80 gsm) bond paper. The number of sheets depends on the paper weight and punch pattern used. Designed for mid to high volume commercial and corporate use.